May is usually a big race month for me and this May is no exception. I will start with a recap of the Mississauga marathon I ran on May 3rd. 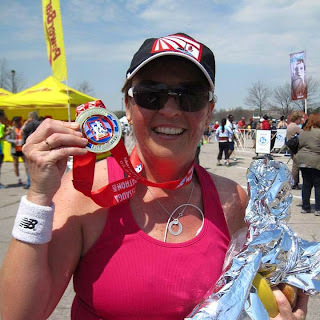 This was my 4th marathon and after the disappointment at the Scotiabank Toronto Waterfront marathon last October I was hoping for a better result this time. I had trained hard and all I wanted was to get to the start line healthy. I have been getting physio on a glute/hamstring issue but I was given the all clear to run and push it on race day. I had told my coach I thought I could do 4:40 and I told my hubby I thought 4:35 to 4:40 and I was close, 4:41:15. I probably started out too fast and I found the last 10K really hard but I hung in there and keep moving forward. It was a much better race in many ways, I never thought "Why am I doing this", I managed to keep the negative voice in my head quiet which is a big accomplishment since my iPod died at 8K and I finally nailed down my nutrition on a marathon with no issues and only one potty stop. I still want to work on staying strong in the last 10K, my hubby managed to negatively split the race so I know it can be done but for me it seems less likely. Next weekend is Tamarack Ottawa Race Weekend, one of my favorite races of the year. This year marks my 6th consecutive year of participating an event this weekend, in 2010 I walked the half marathon and last year I ran the half marathon. It was not a great race so I am back running it, looking for a better result. Running this race reminds me that I am still on track, committed to a health lifestyle and doing things for me, to prove I can dream big and accomplish them with hard work. I love watching the 5 and 10K races on the Saturday night, I ran the 5K three years in a row, I love that race. I love seeing everyone running or walking, dong the race with family or friends, trying for a PB or just hoping to finish. I keep saying this but it is true, if I can do this, anyone can. I am not a super athlete and in fact it is only recently I could call myself a runner and I usually cringe inside when I call myself an athlete. I am someone who tries hard, who is willing to put in the work to accomplish my dreams and I dream BIG. 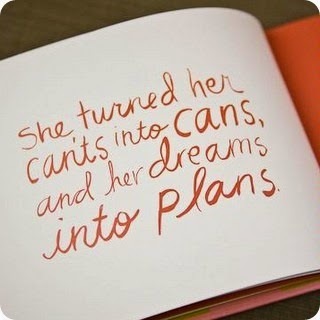 I have proven to myself that I CAN and I WILL and I hope I can inspire others to do the same.